As an admin, you can setup for how long the data will be retained in your domain. 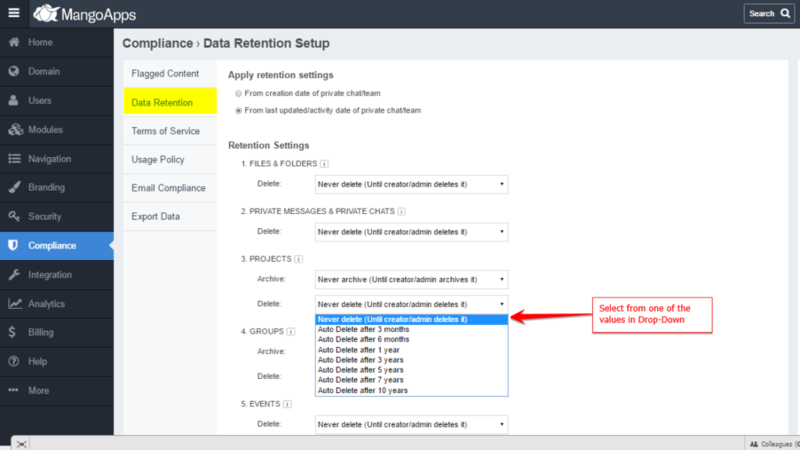 The default option is that data will be retained forever – It is only deleted when the admin or the user who posted the data deletes or archives it. You can, however, choose to specify a different auto-archival and auto-delete rules in the retention settings as per your regulation and compliance requirements. Please note: When the data is deleted it will not be available using APIs or data export. 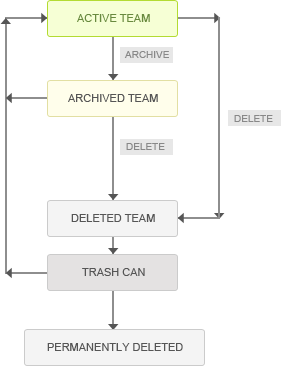 The deleted data will reside in the trash can until the trash can preservation limit, after which it will be permanently deleted and can’t be restored. What happens to the groups and departments synced using AD/LDAP? The archival and delete rules here do NOT apply to groups and departments synced using AD/LDAP. AD/LDAP is considered the master source and MangoApps will retain the sync with the configured AD/LDAP server. When the archive/delete rules are changed, do they become effective immediately? Yes, the archival and delete rules once saved, are effective immediately on the all existing and new content. Please take extra caution before you make changes to your retention settings. We have multiple admins. How do I know who last made a change to the retention settings? All retention setting changes are logged in the Audit Log with the name of the admin who made the change, what the changes were, and the time the change was made. What is the typical retention lifecycle for projects, groups, departments and opportunities?